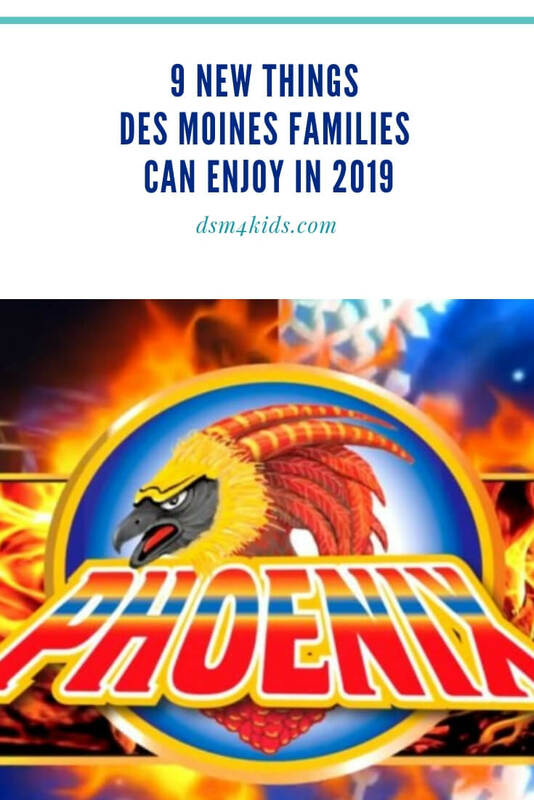 It’s hard to believe that we’re already a few weeks into 2019 — we’re excited to see all the new things Des Moines families can enjoy this year! From a new skate park downtown to a new roller coaster at Adventureland, we know 2019 is going to be the best year yet! Construction is currently under way to construct a new amphitheater, great lawn, celebration lawn, restrooms, marketplace, natural play areas and outdoor classrooms, in Water Works Park and is expected to be completed spring of 2019. In conjunction with the City’s planned renovation of Fleur Drive, the Des Moines Water Works Foundation anticipate the construction of the passageway connecting Gray’s Lake Park to Water Works Park and the surrounding area. Climb Iowa’s second location is set to open in Spring 2019 in the East Village. The new gym will offer over 3,000 square feet of bouldering, along with state-of-the-art Rogue training equipment. Climb Iowa East Village will be a bouldering-only gym with training and fitness as the focus. On July 20, 1969, humans first set foot on the Moon. This year, to celebrate that “One small step for man. One giant leap for mankind.” the Science Center of Iowa will be hosting several events in 2019. Some of the highlights include: an Overnight Adventure: Mission to the Moon on January 25-26th; an Astronaut appearance on March 5th and a full out “Countdown to Apollo 50 Celebration” on July 20th. Be on the lookout for more details on all these events and more throughout the year. Construction of the new 55,000 square feet, two-story Ankeny Kirkendall Public Library is underway. The new facility will be in The District at Prairie Trail and will allow the Library to offer additional programming, increase its circulation and offer more quiet rooms and public meeting space. Construction is expected to be completed summer of 2019. The Lauridsen Skatepark is set to be one of the largest open parks in the nation. The skatepark will be centrally located at the north end of the Principal Riverwalk next to the Des Moines River. At more than 65,000 square feet of skate-able terrain, the design consists of three main areas: the lower plaza/pedestrian walk, the main plaza and the snake run, bowl and pool. The Lauridsen Skatepark is set to open to the public later summer, early fall of 2019. Westgate Drive and NE Dartmoor Drive in Waukee is the location of Fridley Theatre’s newest cineplex. The Palms Theatres will feature an 85-foot IMAX screen and 14 additional auditoriums complete with luxury recliners and in theatre dining options. There will also be a restaurant and bar inside the Palms. Due to construction setbacks the opening of the theatre has been delayed. Current predictions are for a spring 2019 opening. A brand new roller coaster, “The Phoenix”, will rise this year at Adventureland. The coaster will feature 360 degree spinning cars and will reach speeds up to 40 miles an hour. The Phoenix will go where the Super Screamer once sat, and more recently where The Inverter was located. Construction is expected to start in February 2019, with June being a target completion date. After Mom sees New Kids on the Block in the “Mixed Tape Tour” this summer, it will be the tweens and teens turn to see multi-platinum and chart-topping singer/songwriter Shawn Mendes. He will be bringing “Shawn Mendes: The Tour” to Wells Fargo arena in a highly anticipated concert on June 22, 2019 in support of his self-titled third album. Urban Air, a family-friendly indoor trampoline and entertainment center, known for endless hours of trampolining, rock climbing and dodge-balling will build its newest location in Ankeny. With 28,000 square feet of space, the state-of-the-art Urban Air Adventure Park will offer a full line-up of activities. From wall-to-wall trampolines, dodgeball courts, Sky Rider Indoor Coaster, obstacle courses, to tube playgrounds with multi-level climbing ropes and twisting pipes, both thrill-seekers and their pint-sized counter-parts will find an activity to conquer at Urban Air, which is slated to open Summer of 2019. What new thing is your family looking forward to in 2019?